If I could design a theme park around The Simpsons, I’d selfishly want it to be focused on the show’s recent food blog-skewering episode, “The Food Wife.” (That’s why they don’t let like me design theme parks.) 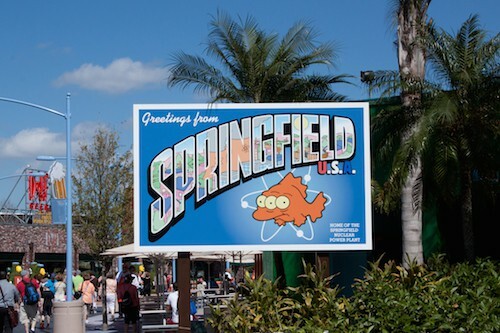 Instead, someone at Universal Studios Florida had the more inclusive idea to build a miniature replica of Springfield, USA, in Orlando—and happily for me, the majority of the place is devoted to food and drink references from the show. My Simpsons-obsessed husband and I spent a day strolling the streets of Springfield, and now we’re sharing what we ate. Because what kind of American man doesn’t want to explore global food culture? And then brag about it on the Internet? Though the facades of Krusty Burger and Cletus’ Chicken Shack look like separate restaurants, each entrance leads to one large food court where you can pick and choose, cafeteria-style, from a bunch of walk-up counters. 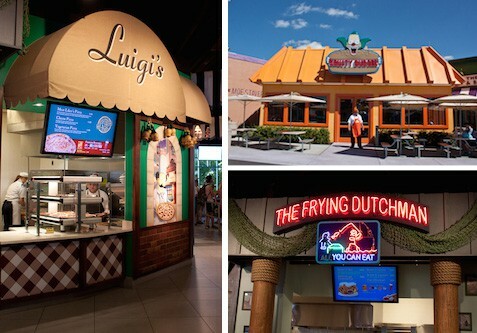 Along with burgers, dogs, and various chicken options (tenders, wings, etc) from Krusty and Cletus, the Frying Dutchman serves fried seafood; Luigi’s tosses out pizza; and Lisa’s Teahouse of Terror has fruit and healthier options, even though we all know you don’t win friends with salad. But we didn’t come to Springfield for a plain old turkey wrap. 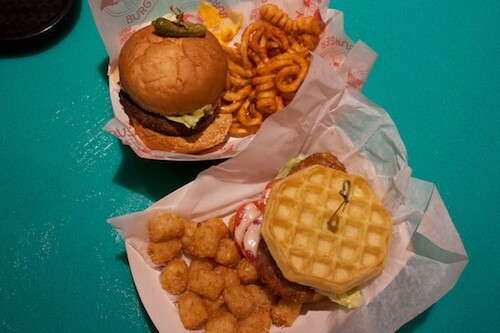 We came to sample an authentic Krusty Burger and a sorta-gross-looking chicken-and-waffle sandwich from Cletus’ joint. Happily enough, this grub totally satisfied my gut worm. Though neither sandwich inspired confidence at first sight, the burger (rich in bunly goodness, of course) redeemed itself through a generous smear of cheese sauce. Instead of the semi-congealed goop you’d find at your typical stadium concession stand, this stuff was fresh, creamy, and almost as good as what Shake Shack offers. It brought the burger up a few notches, especially when paired with special sauce. I’d see if you can get a little extra cheese sauce for dipping those tater tots and curly fries. It never hurts to ask. Likewise, the chicken-and-waffle sandwich won me over—or maybe it wore me down—after a few bites, once I removed the wan and flavorless tomato and lettuce. The waffles were just a tad sweet and Eggo-y but still crisp at the edges, and the chicken itself on par with Wendy’s, but somehow the honey mayo drizzled on the chicken breast made everything a little better than I expected it to be. 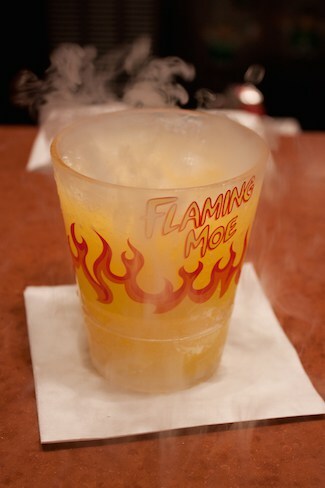 Overall, the Springfield food court offerings were glorified mall eats, but happiness is a Flaming Moe away—literally a few steps away, through a doorway leading into Moe’s Tavern. Unlike the more generic food court, this room is a nearly impeccable recreation of the cartoon bar, from the diamond-patterned windows and red vinyl booths to the pool table, Love Tester game (I got Cold Fish! ), and even a red telephone on the corner of the bar itself. Sometimes it rings; pick up the receiver and see who’s on the other end. 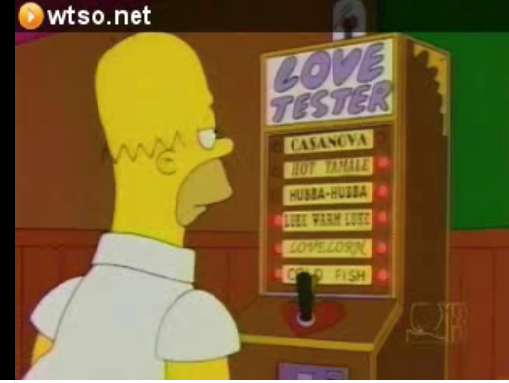 Especially if your name is Seymour Butts or Hugh Jass. 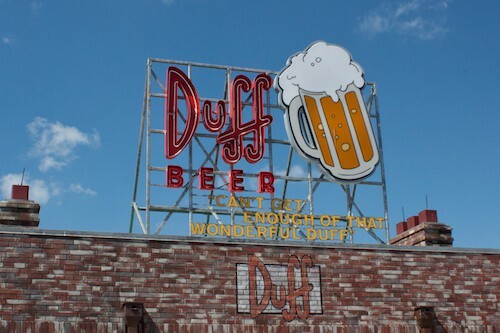 Duff, Duff Lite, and Duff Dry—as well as a trio of Squishee flavors—are also on tap at the outdoor Duff Gardens pavilion across the street from Moe’s. Don’t worry, roaming gangs aren’t a big problem any more, and there’s enough Duff Beer for me and for you. 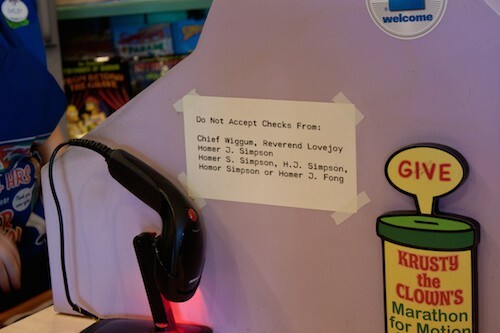 The Kwik-E-Mart, where you’d expect to find the Squishee machine, is actually the de facto gift shop for the theme park. Though you sadly can’t buy Frosty Krusty Flakes, Krusty Brand Slender Vittles, or Krusty Pork Products there, you can get an authentic Bart Simpson skateboard or a Springfield Isotopes baseball. 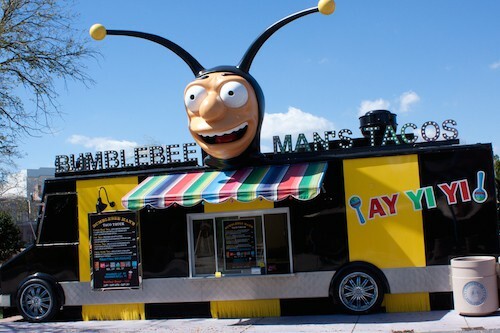 The lines for Bumblebee Man’s taco truck are nonexistent compared to the controlled chaos of the food court, and this might be your best bet if you’re looking for a quick, filling bite while in Springfield. The meat inside the Korean beef tacos we sampled was an appealing though muted version of shredded bulgogi, with fresh and crunchy frisée and radish for contrast. 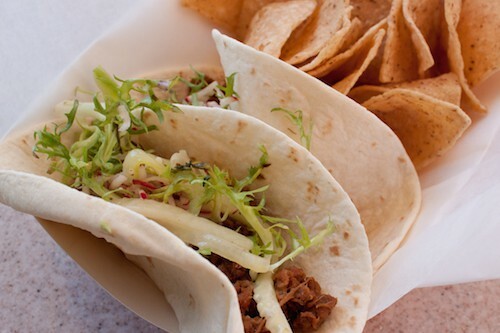 But the bland, run-of-the-mill chips served with the tacos? No me gusta, Bumblebee Man. 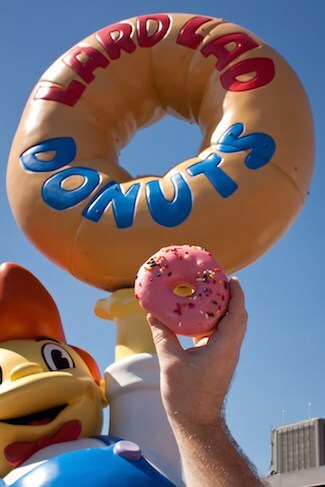 After all that fried fare, I couldn’t bring myself to get the Big Pink from the Lard Lad donut stand—it’s an oversized pink frosted donut that looks more like a pool toy. (Mmmm, forbidden donut.) Luckily, the spot serves regular-sized donuts for those of us who don’t have Chief Wiggum-sized appetites. They’re nothing more exotic than what you’d find at your neighborhood Dunkin’, but again, they get points for authenticity and they make for amazing photo ops. Donuts—is there anything they can’t do? Because there are only two rides—an animated trip through Krustyland on the Simpsons Ride and a tame twirling ride featuring Kang and Kodos that’s better suited for kiddos—the time spent exploring the edible options is really the best way to get the flavor of the Simpsons’ little corner of the world. It may not be the best. food. ever., but stopping to share a drink or a snack lets you see more of the details that make Springfield so well-defined—like the boxes for wadded beef stacked on the upper shelves of the Kwik-E-Mart, the true-to-cartoon uniforms worn by each employee (bowties and aprons for the Moe’s bartenders, bumblebee costumes for the kids at the taco truck), and the specifically chosen clips from the show that play in each building. 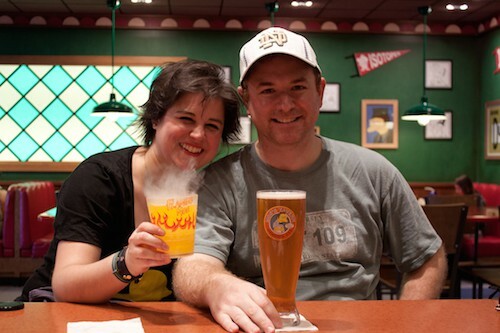 Seriously, if you’re a Simpsons fan, hike up your pie pants and get down to Orlando. Because this town is a part of us all… a part of us all… a part of us all.